When I reviewed the Cell Renew Face Cream and Sleeping Mask on Monday, I mentioned that I’ve been using the whole Super Aqua Cell Renew Snail skincare line from Missha for the past few months. That line consists of a skin treatment/essence, an emulsion/moisturizer, a face cream, and a sleeping mask. Today I’ll be reviewing the skin treatment and moisturizer! I bought them together as a set, but they are also sold individually. Individually, they retail for about $34. The set, which comes with a full size bottle of the skin treatment and the moisturizer as well as a travel size of each product, retails for $70, but I bought it during a 30% off sale so I only paid $49. Snail Slime Extract – Contains proteins, glycolic acids, and elastin to help prevent scarring and promote skin healing. This serum is 30% snail slime extract. Botanical Stem Cell Extract – Botanical Stem Cells are a popular skincare hype ingredient right now. Unfortunately, hype is all it is. Plant stem can only help the plant they’re derived from. They definitely can’t influence human cell growth. They are not harmful, but they aren’t helpful either. Baobob Extract – Possesses essential fatty acids Omega 3, 6, and 9, as well as Vitamins A and E.
Phytoncide Water – A plant-derived essence with antibiotic properties. I couldn’t find a lot of research on it, but it seems to be a popular Asian skincare ingredient. The ingredient I’m most excited about is Niacinamide, which happens to be one of my favorite skincare actives. Niacinamide (AKA Viamin B3) is a really fantastic hydrating, anti-inflammatory ingredient that has been clinically proven to reduce the appearance of wrinkles (Bissett-Oblong Study), reduce redness (Draelos-Ertel-Berge Study), and treat acne (Hakozaki et.al. Study). I would also add Portulaca Oleracea Extract (AKA Common Purslane Extract) to that lineup, which contains essential fatty acid Omega 3, as well as Vitamins A, B, and C. I’m also excited about the Sodium Hyaluronate, better known as Hyaluronic Acid, which helps skin attract and absorb moisture, as well as prevent trans-dermal water loss. When I run the ingredients list through COSDNA, there are a few potential irritants. One is the denatured alcohol, which acts as a solvent. It has an irritant potential of 3 (out of 5). The big one is triethanol amine, a pH adjuster with an irritant potential rating of 4 (out of 5), and an acne potential rating of 2. The US Missha site is a little thin in terms of product descriptions, but I’ve found that the New Zealand site is very generous with product information! 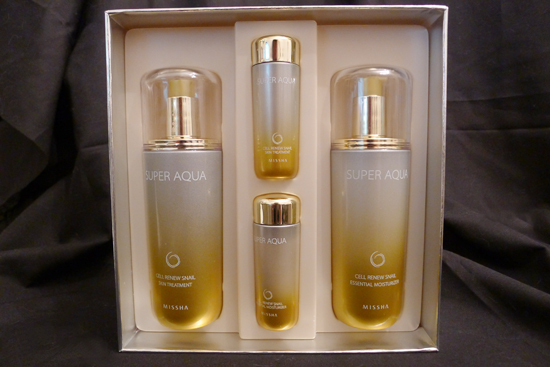 According to that site, the Super Aqua Cell Renew Snail line is made for women in their 20s-40s, who want to improve skin tone, elasticity, and repair skin damage. The Snail Skin Treatment in particular is described as a booster that will maximize the efficacy of the products that follow it. The site also says this product has wrinkle fighting and whitening properties. Because it’s an essence, I apply the Cell Renew Snail Skin Treatment immediately after my toner (I’m using First Essence Treatment as my toner). I use two to three pumps, and rub the liquid between my hands before patting it gently over my face. The consistency of the Snail Skin Treatment is very much like that of a traditional serum – it’s a mostly clear liquid that’s a little thicker than water, but thinner than a gel. It absorbs very quickly – within a minute or so. It has the same lovely, fresh, floral scent that the other products in this line have. The product is heavily fragranced, so those with fragrance sensitivities should beware. I don’t have any issues with fragrance, and I really enjoy the smell of this stuff. I loved the pumps on these bottles. They only dispense a little bit of product at a time, so it’s very easy to control the amount you’re using. I’ve been using the Snail Skin Treatment in conjunction with the other products in the line for about three months now, and I have to say, I definitely see a visible improvement in my overall skin tone. My old acne marks are lighter, and the marks I’ve gotten from the few pimples I’ve had over that period have been significantly less prominent. Additionally, I’ve had a pretty drastic reduction in the number of breakouts I get. I think the reduction is the result of using the whole Cell Renew line, not just the Skin Treatment alone, but the reduction has been significant enough that I went from applying my prescription retinoid every night to only applying it every 2-3 nights! It’s also worth mentioning that there is a TON of product in these bottles. There is well over 60% of the bottle remaining, even though I’ve been using it twice a day for nearly three months. Performance: 5/5 – When used with the rest of the Cell Renew line, it significantly faded acne marks and improved skin tone. The Cell Renew line also reduced breakout occurrences. Provides a nice extra layer of moisture. Quality: 4/5 – Contains a lot of nice skincare actives, including one of my favorites, Niacinamide. It does contain a few potential irritants, but I personally didn’t experience any issues and my skin is on the sensitive side. Packaging is beautiful and very sturdy. Value: 5/5 – $34 for a bottle that will last a good 7-8 months is a fantastic value. Bonus: Missha has a lot of sales. Missha cites the same star ingredients as the other Cell Renew products – the Snail Slime Extract, the Baobob Extract, the Phytoncide Water, and the Stem Cell Extract. You can see my thoughts on those in the Skin Treatment review above. But there is so much more to love in this ingredient list! Obviously, I’m excited to once again see my BFF, Niacinamide. But it also contains moisturizing Mango Seed Butter, which has essential fatty acids in addition to Vitamins A and E. There are also a couple of ingredients I’m excited about that I wasn’t familiar with until I researched this list. One of those things is the Echium Plantagineum Seed Oil, which contains high levels of alpha linolenic acid, gamma linolenic acid, and stearidonic acid. All three of those are great anti-inflammatories, and they also promote cell renewal and prevent trans-dermal water loss. Then there is the Cardiospermum Haliacacabum Vine Extract, which is also an anti-inflammatory in addition to being anti-fungal and anti-bacterial. The downside is that when I ran the ingredients list through COSDNA, there were several ingredients that scored high for irritation potential and acne potential. It contains Cetyl Alcohol, which is a known acne trigger. It has a score of 5 out of 5 for acne potential and a 2 out of 5 as an irritant. Triethanol Amine scored a 2 for acne potential, and a 4 out of 5 as an irritant. Sorbitan Oleate scored a 3 for acne potential, and Stearic Acid received a 2. Octyldodecanol, which is actually a really fun word to say, has an irritant score of 3 out of 5. Once again, I consulted the Missha New Zealand site for the product description because the Missha US site doesn’t have as much information. According to that site, the Super Aqua Cell Renew Snail Essential Moisturizer will repair and balance damaged skin, and possesses anti-wrinkle and whitening benefits. This moisturizer is meant to be applied directly after the Skin Treatment. However, I use a face oil in my skincare routine, so I actually apply this moisturizer after my face oil. I use 2-3 pumps per application. The texture is really nice – it’s a bit thicker than my Cerave lotion, but not as thick as my Cerave cream. As a moisturizer, it is very hydrating, and for people that have normal or oily skin, this will be the only moisturizer you’ll need. My skin is extremely dry, so I still use my face oils in conjunction with this, and at night I also apply the Cell Renew Snail Face Cream. I was afraid that I might experience some breakouts or irritation since there were many offenders in the ingredient list for this product. However, I did not experience any issues with breakouts or irritation. This was surprising to me since my skin does tend to be sensitive, and I would still advise others with sensitive skin to proceed with caution. That said, I saw really beautiful results with this product. After using this moisturizer for three months in conjunction with the rest of the Cell Renew Snail line, I saw great improvement in my overall skin tone, and the frequency of my acne flare-ups was reduced enough that I went from applying my retinoid nightly to only applying it every 2-3 nights. Impressive, right? As I stated previously in my Skin Treatment review, I do think my results are from using the whole line, and not just a single product. Much like the Snail Skin Treatment, there is TON of product in the Snail Essential Moisturizer Bottle. There is well over 60% of the bottle remaining, even though I’ve been using it twice a day for nearly three months. 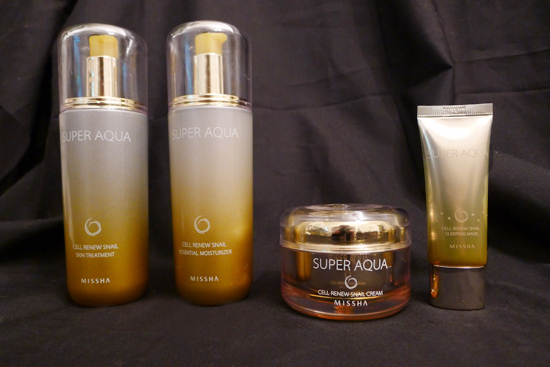 My overall impression of the Super Aqua Cell Renew Snail skincare line is very positive. I really enjoy using these products, and I am very happy with the results I’ve seen. If I weren’t so obsessed with testing new products, I would definitely purchase the Super Aqua Cell Renew Snail line again! I still have many months to go before I use all these products up, which gives me plenty of time to think about what I’ll try next. I do know that the Asian Skincare Routine is working well for me and I will probably try another Asian line. Laneige, Amore Pacific, and Shiseido are all in the running. If you have an opinion of what you’d like to see reviewed, please let me know! Performance: 4/5 – Adequately hydrating, though not quite as moisturizing as a Cerave cream. When used in conjunction with the rest of the Super Aqua Cell Renew Snail line, it significantly faded acne marks and improved skin tone. 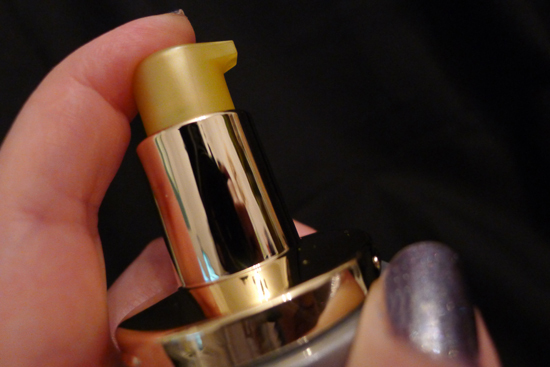 Quality: 3/5 – This product contains lots of really great skincare actives, and I wish I could give it a higher score! Alas, it also contains a few known irritants and a couple of potential acne triggers. I didn’t have issues, but I would warn those with more sensitive skin to proceed with caution. Packaging is beautiful and very sturdy. You can find the Super Aqua Cell Renew Snail Skin Treatment and Essential Moisturizer on Missha’s US Website for $34 each, or $70 for a set which also includes a travel size of each item. Missha frequently has sales, which would be a great time to pick this up. This week, they’re doing a special where any purchase from the Super Aqua Snail line will include some free Snail Gel Sheet Masks like the ones that were included in last month’s Glossybox. I did a quick search on eBay and Amazon to see if anyone was selling these at a discount. They weren’t any cheaper there, and in some cases, they were actually charging a few dollars more. You know, I have a couple of untouched deluxe travel size bottles for the treatment and the moisturizer. I’d be happy to send them to you. Email me if you’re interested! i have been sitting on the fence about using snail cream and your review has pushed me to try it. if your samples are still available, i’d love to try their line of products. thank you!!! Hi Shirley! As a matter of fact, they are still available. If you could email me at hello@skinandtonics.com, I’ll make arrangements to mail them to you! I was wondering if you could tell me which one performs better, Misha’s snail cream OR Mizon’s, I use mizon’s and I really like it but I wonder if misha’s is better. Hi, I was looking for a moisturizer and was wondering whether this is good or if I should use a product from Benton or Mizon? This is the best review I’ve ever read. thank you very helpful 🙂 I will try this skincare line thought i have a very dry and sensitive skin but heard a lot of good reviews to this line. thanks again.